The sparks that appear on the baseball-sized rock (starting at :17) result from the laser of the ChemCam instrument on NASA’s Curiosity Mars rover hitting the rock. 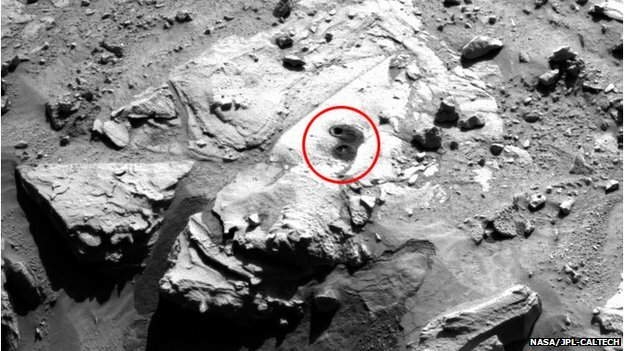 ChemCam’s laser zapping of this particular rock was the first time the team used Curiosity’s arm-mounted Mars Hand Lens Imager (MAHLI) camera to try and capture images of the spark generated by the laser hitting a rock on Mars. Their efforts were a success. The video is compiled from single images from the MAHLI camera, taken during the 687th Martian day, or sol, of Curiosity’s work on Mars (July 12, 2014). Since Curiosity landed in Mars’ Gale Crater in August 2012, researchers have used ChemCam’s laser and spectrometers to examine more than 600 rock or soil targets. The laser itself has been fired more than 150,000 times. The process, called laser-induced breakdown spectroscopy, hits a target with pulses from the laser to generate sparks, whose spectra provide information about which chemical elements are in the target. Multiple laser shots are fired in sequence, each blasting away a thin layer of material so that the following shot examines a slightly deeper layer. In this case, “Nova” displayed an increasing concentration of aluminum as a series of laser shots from the rover penetrated through dust on the rock’s surface. Curiosity Rover team members at NASA’s Jet Propulsion Laboratory (JPL) in Pasadena, Calif., re-live the dramatic Aug. 6, 2012 landing and the mission’s achievements to date in an event aired on NASA Television and the agency’s website. In the year since inspiring millions of people worldwide with its one-of-a-kind landing in a crater on the Red Planet, Curiosity has achieved its primary scientific objective; finding evidence that ancient Mars could have sustained microbial life and has returned invaluable scientific data and images. Nasa’s Curiosity Mars rover has finally begun the long drive to its primary mission destination – Mount Sharp. For the past seven months, it has been investigating a site just east of its August 2012 touchdown point, drilling rocks and analysing their composition. But scientists have now decided it is time for Curiosity to get rolling. On Friday, engineers commanded the vehicle to make an 18m drive. On Monday it travelled 40m. It will however take many months to reach Mount Sharp. The rover has to steer clear of a long bank of sand dunes that represent a potential trap. The intention also is to get to a specific site where satellites have indicated there are layers of sediment that were potentially laid down in water. All up, this could see Curiosity having to roll roughly 8km to get to the places of key scientific interest. And if the cameras onboard spot unusual rocks, the rover will be commanded to park and examine them…. This is a time lapse video from the Curiosity Rover, created with the Raw Images available at http://mars.jpl.nasa.gov/msl/multimed&#8230; . Created from using only Full Data Product from the Front Left Hazcam and covers the period between Sol 0 (August 8th, 2012) and Sol 281 (May 21st, 2013). Why is Curiosity Looking for Organics? The sample comes from a fine-grained, veiny sedimentary rock called “John Klein,” named in memory of a Mars Science Laboratory deputy project manager who died in 2011. The rock was selected for the first sample drilling because it may hold evidence of wet environmental conditions long ago. The rover’s laboratory analysis of the powder may provide information about those conditions.